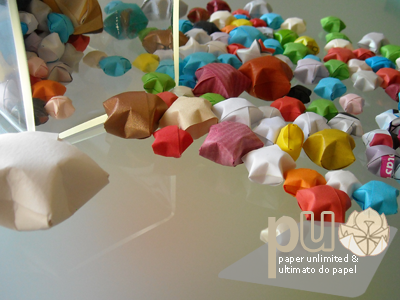 You can find kits with many different types of paper strips too! Iridescent paper, glow in the dark paper, pearl paper, … I have yet to buy one of those kits but I’m quite curious to see the effect of some of those papers in the stars. If it’s the first time you make one of these stars perhaps it’s best to start with a 20x420mm /0.78×16.5″ strip of paper (from an A3 sheet) but you can try 10~15x297mm /0.40~0.60×12″ (from an A4 sheet). The more the paper weights the larger can the strip be. Basically you make a knot with the strip; you crease the resulting pentagon really well and after that you fold, no creasing here!, the remaining strip around the pentagon. On the last steps the star gains some volume so you inflate the star a bit by pushing the half of each side of the pentagon to the centre; if you can visualize better it’s almost as if you pinch each two adjacent sides of the pentagon. 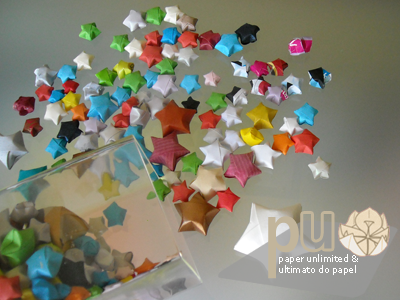 The result is the same: a nice 3D star. The first stars can be weird or even not so good looking but after a while you’ll be making perfect stars. 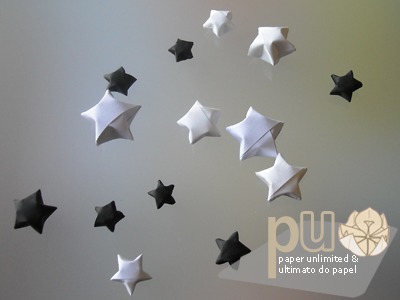 As soon as I find my black paper I’ll restart doing black stars to fill a jar with black and white stars. These are the first ones I made in black and white only. This entry was posted on 2010|08|02 at 16:45 and is filed under diagrams, origami. You can follow any responses to this entry through the RSS 2.0 feed. You can leave a response, or trackback from your own site. These are so cute! I love them! I’m just starting to fall in love with everything origami so I think I need to try these! Thanks for sharing.